Vesicoureteric reflux (VUR) can be “secondary,” for example associated with anatomical obstruction to bladder outflow; more often, however, it is a “primary” lesion, associated with failure of the anti-reflux mechanism at the ureteral-vesical junction. Reflux nephropathy describes parenchymal kidney disease associated with vesicoureteric reflux (VUR) (1,2). Renal parenchymal damage that occurs in childhood in the context of primary VUR has been considered to predispose to hypertension (3), complications during pregnancy, and pre-eclampsia (4). Furthermore, long-term follow-up studies of children with bilateral nephropathy and primary VUR show a small but significant risk of developing end-stage renal failure (5,6); in a recent survey, reflux nephropathy was present in 7 to 9% of children and adults in UK dialysis and kidney transplant programs (7). There has been a perception that renal damage is intimately linked with VUR in the context of UTI occurring in children. This perception, and awareness of the long-term complications listed above, have driven physicians to investigate childhood UTI intensively. Radiology tests designed to detect VUR, rather than renal parenchymal disease, are often instigated in children with UTI, because the triad of UTI/VUR/nephropathy is generally accepted. VUR is detected by micturating cystography (MCU), whereas scanning with 99mTechnetium-dimercaptosuccinic acid (99mTc-DMSA), which is concentrated in functioning cortical kidney tubules, is the most sensitive test to detect focal kidney abnormalities, including scars of infectious origin, both in patients (8) and in experimental animals (9). However, not all new 99mTc-DMSA defects equate with scarring, because some defects associated with acute pyelonephritis resolve within 6 mo (10). Primate experiments demonstrate that ascending pyelonephritis can follow introduction of Escherichia coli into the bladder without VUR (11), perhaps facilitated by specific adhesins on bacterial P-fimbriae (12). These laboratory results support anecdotal observations that renal parenchymal damage can be acquired in children after UTI, despite a failure to detect VUR (13). Such diverse observations prompted us to perform a systematic literature review and meta-analysis to determine how effectively the finding of primary VUR on MCU in children hospitalized with UTI predicted renal parenchymal disease on 99mTc-DMSA scintigraphy. The period covered in our literature search was 1966 to 2002 using the Silver-Platter/Medline and Embase, and we considered studies published in all languages. The search strategy was as follows, including all subheadings of the terms: (1) pyelonephritis, urinary tract infection, cystitis; (2) vesico-ureteral reflux, vesicoureteric reflux, cystogram, cystography; (3) renal damage, renal scar, dimercaptosuccinic acid, and succimer; (4) 1 + 2 + 3. Figure 1 is a flow chart of literature search and review. This resulted in 838 records. Based on titles and abstracts, 195 articles were read, and a second search, based on references in these articles, yielded another 18 articles in English and 6 with English abstracts. A third search based on authors’ names generated a further 16 articles. Figure 1. Flow diagram of selection processes of articles used in the current review. * Exclusion criteria comprised one or more of the following: one children with vesicoureteric reflux (VUR) included; only children with abnormal 99mTechnetium-dimercaptosuccinic acid (99mTc-DMSA) scans included; more than 10% of children excluded for no reason; review article with no new data; more than 10% of children did not have either DMSA scan or micturating cystography (MCU). Eligible published studies used in this analysis were of hospitalized children with bacteriologically proven UTI who had undergone both 99mTc-DMSA and MCU. Furthermore, all results for these two tests must have been considered in the reports. To minimize bias, we excluded published studies in which 10% or more of children’s results had been excluded from analysis for no stated reason. Data from children with VUR and either an abnormal bladder or urinary tract obstruction were excluded. A data extraction form was piloted and modified. Two authors (IG and MB) read the articles and completed the extraction forms independently; when discrepancies occurred, the articles were reviewed and consensus reached. The association between the DMSA and MCU findings were analyzed using likelihood ratios. The likelihood ratio positive is the odds of a positive scan given a positive MCU, divided by the odds of a positive scan overall. It shows how a positive MCU affects the odds of a positive DMSA scan. The likelihood ratio negative has the corresponding meaning for a negative DMSA scan and negative MCU. The data were analyzed separately for children and kidneys. For each study the likelihood ratios positive and negative for MCU were calculated with their standard errors as follows: Likelihood ratio positive = Sensitivity/(1 − Specificity); Likelihood ratio negative = (1 − Sensitivity)/Specificity. 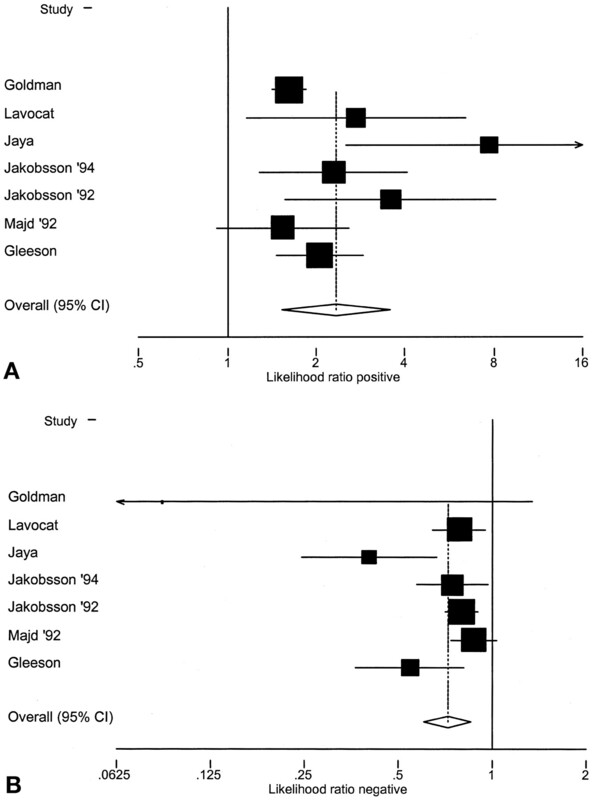 The likelihood ratios were then combined across studies using random effects meta-analysis. Heterogeneity was tested for by χ2. Twelve studies fulfilled the criteria, seven (14–20) presenting data for children and seven (15,18,21–25) for kidneys, with two studies (15,18) giving data for both. One study (15) gave results for scans at two time points, <6 wk and at later follow-up; the earlier ones are used here. The method of selection of these studies is further depicted in Figure 1, and Table 1 gives details of the individual studies, including the ages of patients and timings of the 99mTc-DMSA scans. The median or mean age was less than 1 yr in five studies, less than 3 yr in two, and greater than 3 yr in two (and unspecified in the other three). The 99mTc-DMSA scan was done within 6 wk of the infection in six studies, between 6 wk and 6 mo in two, and after 6 mo in four. Within the group of 537 children, VUR was detected in 34% and an abnormal 99mTc-DMSA scan in 59% (range, 33 to 78%). The likelihood ratio positive for MCU was 1.96 (95% CI, 1.51 to 2.54) and the likelihood ratio negative was 0.71 (0.58 to 0.85) (see Figure 2, A and B). The test for heterogeneity between studies was insignificant for the positive (χ2 on 6 d.f. = 5.5; P > 0.4) and marginally significant for the likelihood ratio negative (χ2 on 6 d.f. = 12.8; P = 0.05). Figure 2. (A) Likelihood ratio positive for children; (B) likelihood ratio negative for children. Within the group of 1062 kidneys, VUR was detected in 31% and an abnormal 99mTc-DMSA scan in 36% (range, 9 to 61%). The likelihood ratio positive for MCU was 2.34 (1.53 to 3.57), and the likelihood ratio negative was 0.72 (0.61 to 0.86) (see Figure 3, A and B). There was clear evidence of heterogeneity between studies for both the likelihood ratio positive (χ2 on 6 d.f. = 33.5; P < 0.001) and likelihood ratio negative (χ2 on 6 d.f. = 18.1; P = 0.006). Figure 3. (A) Likelihood ratio positive forkidneys; (B) likelihood ratio negative forkidneys. To reduce bias, we excluded from the current analysis nine studies, in which more than 10% of patients had been excluded for no obvious reason. Including these studies makes little difference to the results, reducing the likelihood ratio positive by 0.14 and the likelihood ratio negative by 0.06, but it appreciably increases the heterogeneity in all analyses. This provides some justification for their exclusion, as their results are more variable than for the included studies. This is the first systematic review and meta-analysis addressing whether primary VUR, as demonstrated on MCU in children hospitalized with UTI, effectively predicts renal parenchymal disease on 99mTc-DMSA scintigraphy. Our search was comprehensive, and, although we observed that numerous studies had been reported in the literature, few were useful for a systematic review. For example, in some reports, only positive results were reported, a prominent example being the International Reflux Study (26). In others, children were excluded for no stated reason, introducing potential bias. Furthermore, patient selection was not clearly described in some studies, so that representativeness could not be tested. We considered that the hospitalized patients, used in our analysis, would represent the “most extreme” disease with a high chance of renal defects associated with UTI. Accordingly, the high prevalence of abnormal 99mTc-DMSA scans noted (59% of children, and 36% of kidneys) was not unexpected, especially because most studies in the meta-analysis were done within 6 wk of the UTI. In the future, it would be interesting to analyze a separate group of studies that addressed outpatients only. The current analysis shows that primary VUR is a rather weak predictor of renal damage in such patients and that renal damage often occurs in them without demonstrable VUR. As reviewed by Guyatt et al. (27), if a diagnostic test has a likelihood ratio positive of 2 to 5, it “generates a small (but sometimes important) change in probability;” if it has a likelihood ratio negative in the range 0.5 to 1, it “alters the probability to a small (and rarely important) degree.” The current meta-analysis shows that in children hospitalized with a UTI, the MCU-detected VUR is relatively uninformative for identifying or excluding children who have renal damage identified by 99mTc-DMSA scan. The odds of a positive renal scan are roughly doubled when the MCU is positive, and they are reduced by a factor of 0.7 when the MCU is negative. Table 2 shows how a MCU confirming VUR affects the chance of a positive or negative 99mTc-DMSA scan, for a range of population prevalence values seen in the individual studies. Assuming likelihood ratios positive and negative of 2.3 and 0.7, a positive MCU increases the chance of a positive scan by about 20%, whereas a negative MCU increases the chance of a negative scan by only 8% or so. On this basis, it is difficult to justify the commonly followed clinical strategy of using the MCU as a screening test to decide whether to go on to detect renal parenchymal damage; furthermore, a negative MCU provides virtually no extra information regarding the presence of renal defects. We were not able to extract sufficient data in enough studies to comment on whether more severe grades of primary VUR were better predictors of renal damage versus minor grades; one of the studies used in the meta-analysis, however, did find a positive relation between the degree of VUR and the presence of 99mTc-DMSA defects (25). Similarly, the meta-analysis cannot address the relation between VUR and renal damage detected by other techniques such as ultrasonography or intravenous pyelography. The American Academy of Pediatrics has made recommendations on the diagnosis, treatment, and evaluation of an initial UTI in febrile infants and young children (28). They recognize that “UTI are important because they … may result in long term medical problems, including hypertension and reduced renal function” and “… pyelonephritis … and progressive renal scarring … can occur in the absence of demonstrated VUR” (28). The Academy suggests that infants and young children 2 mo to 2 yr of age with UTI should undergo ultrasonography, with either voiding cystourethrography or radionuclide cystography with a view to detecting dilatation secondary to obstruction and VUR (28). Clearly, ultrasonography and MCU are important techniques for detecting and defining urinary flow impairment in young children with UTI (e.g., a child who might have posterior urethral valves). In addition, the discovery of primary VUR in a child with UTI may be clinically useful because it allows initiation of prophylactic antibiotics if this is considered appropriate by the investigating physician. The American Academy of Pediatrics has stated that the role of radionucleotide renal scans (e.g., 99mTc-DMSA) in evaluation of febrile young children with first UTI “… is still unclear” (28). It is true that there exist no comprehensive studies that define the precise increased risk that DMSA defects visualized after UTI might confer regarding future hypertension and/or renal impairment; furthermore, most reports cited in the Introduction that link reflux nephropathy to such long-term complications have used intravenous pyelography rather than isotope scans. However, we suggest that it would be reasonable to conclude that the population of patients with 99mTc-DMSA defects related to UTI does contain individuals at risk of complications, even though this risk cannot presently be quantified. For example, in the follow-up study by Smellie et al. (5), of 52 patients with VUR and bilateral renal defects confirmed by urogram and also isotope renogram, four developed end-stage renal failure over a ten year period. At present, in the absence of definitive evidence of prognostic significance of DMSA defects, individual physicians must decide whether such defects are worth finding. However, our current study emphasizes that primary VUR detected by cystography is a weak predictor of renal isotopic defects and that absence of demonstrable VUR by no means rules out such renal defects. The incidence of VUR in asymptomatic young children is considered to be 0.5 to 2% (1), whereas the incidence of VUR in the current study population was much higher. Hence, in children hospitalized with UTI, VUR is relatively common. In many cases, however, MCU detection of VUR was not predictive of renal damage on 99mTc-DMSA scan. This suggests that the reflux of infected urine does not always cause renal parenchymal damage. Perhaps some kidneys are protected from the influx of infected bacteria from the renal pelvis into the collecting ducts by differing anatomical structure of their papillae, i.e., the presence of compound versus simple papillae (1). Alternatively, some kidneys might be protected by prompt antibiotic treatment or by poorly understood genetic or environmental factors that modify the degree of renal parenchymal inflammation (29); the current studies do not allow us to test either hypothesis. Why are damaged kidneys seen in children with UTI, when VUR was not detected by MCU? A trivial answer might be that VUR was present at the initiation of UTI but had regressed by the time of the MCU; this argument is difficult to sustain because most MCU were performed soon after the UTI. In one study, MCU was undertaken both during the acute UTI and afterwards; this showed no difference in the frequency of VUR (29). A second possibility, based on the observation that VUR associated with nephropathy can spontaneously regress during childhood (5), is that renal defects visualized on 99mTc-DMSA scan represent pyelonephritic damage that was long-established and unassociated with a recent UTI. This hypothesis is untestable because the baseline renographic status of the study children was unknown. A third possibility, alluded to in the Introduction, is that some bacteria access renal parenchyma from the urinary bladder either by direct ascent up the ureter without VUR or by hematogenous spread; the latter theorem could be tested by performing blood cultures at the time of UTI. A final explanation for finding renal parenchymal disease without VUR is suggested by the discovery that not all reflux nephropathy is caused by pyelonephritis; indeed, with the increasing use of routine fetal ultrasonography, it is apparent that some individuals with VUR are born with parenchymal disease associated with renal dysplasia (immature tissues) and/or hypoplasia (too few nephrons) (30–33). In some of these individuals, the VUR can regress in the first months or years of life (31) but bladder dysfunction persists (34), perhaps predisposing to UTI. In the current meta-analysis, it was not known if patients had congenital renal parenchymal disease. The published studies reviewed in this report are observational, and the children studied are a selected group of the sickest children with UTI. With these caveats in mind, the meta-analysis supports the contentions that: (1) primary VUR is neither sufficient on its own, nor is it essential for the development of renal damage in the presence of a UTI; (2) the pathogenesis of renal damage should be reconsidered in the light of finding UTI with no VUR; (3) most important clinically, in individuals who have been hospitalized with UTI, cystography should not be used as a screening tool to exclude renal defects. ASW acknowledges grant support from the Kidney Research Aid Fund and the National Kidney Research Fund. Mild Fetal Renal Pelvis Dilatation--Much Ado About Nothing? Is reflux nephropathy preventable, and will the NICE childhood UTI guidelines help?